Didi Lazare Hirsch (1918-1975) was an active member of United Hostesses’ Charities, a group that supported heart programs at Cedars-Sinai Medical Center in the 1960s. With an MSW from the New York School of Social Work, Didi was interested in supporting “the mind as well as the heart” and asked United Way to introduce her to a few worthy mental health agencies. She became a supporter of Los Angeles Psychiatric Service, which started in 1942 to serve adults affected by the Great Depression, and soon joined its Board of Directors. 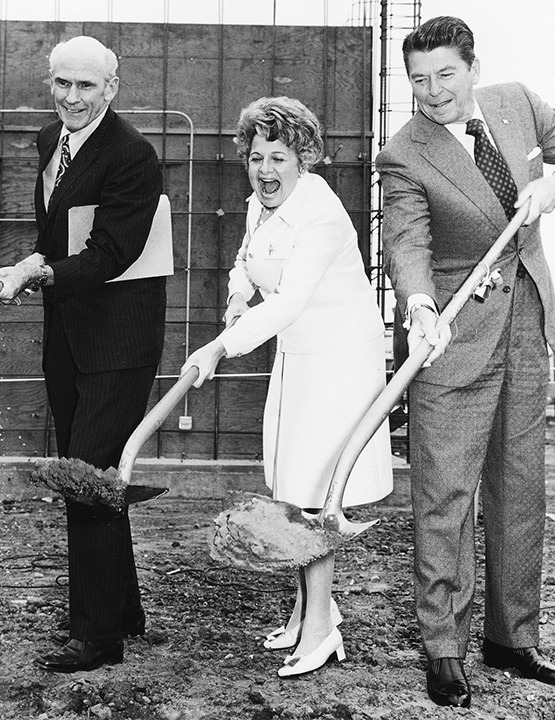 When the agency had the opportunity to become a federally designated Community Mental Health Center, Didi and her husband, Kingdon, donated seed money to create a new headquarters in Culver City where both children and adults could receive services. Didi died in 1975, shortly after dedicating the new building; Kingdon continued to support the organization until his death in 1987. The couple’s legacy of philanthropy continues through their children, former U.S. Ambassador Nancy Hirsch, Patrice Feinstein and David Hirsch. They and their spouses, children, grandchildren and extended family members remain actively involved with Didi Hirsch Mental Health Services, which now serves thousands of low-income families throughout Southern California and is home to the nation’s first Suicide Prevention Center.